Due to mental backwardness of so called Nigerians, they find it difficult to comprehend certain critical issues even when only common reasoning can easily ascertain simple phenomena or things happening within their social environment; yet, they remain adamant to perceive the exact information. First impression matters a lot, Buhari made it clear to the understanding of everyone that his main purpose of seeking for highest political office in Nigeria was total Islamization of Nigeria which his forefather Usman Danfodio could not accomplished during his time. Usman Danfodio's son/grand son; Amadu Bello was reportedly said “Nigeria as the estate of their grandfather, they must continually have full control and dominion over South as a conquered territory, their future and affairs subdued”. In line with Northern hegemonic inherit socialization, Buhari’s family finds it deem fit to subdue everybody to their will without objection; whether it favors you or not; her daughter charged her co-Muslim brotherhoods to kill every Christian till they all turn to Muslim. Already it was broadcasted on Radio Biafra that Buhari has no good plan for Nigeria other than total Islamization; short sighted Nigerians tag it hate speech even when it is on record when Buhari intentionally said “I will openly show inside of me total islamization in all extreme ends of Nigeria; he continue saying - God’s willing it is a task that must be done’’. Some still regard it as a mere talk, today those Radio Biafra critics’ are nowhere to be found when all Christian activities was banned in Kastina State University. Islamic law is speedily on second reading in the Senate to include it in both common and criminal law at same time extend it to all the 36 states of the federation. Nigeria as a member of Organization of Islamic Countries OIC; having mentioned Islam in the Nigerian constitution many times without any atom of further argument with common application of reasoning, you ought to acknowledge Nigeria as an Islamic country than secular state. Education, banking are not exceptional; they want to have total control of all spheres of life so that non Muslims mainly Biafrans will not escape it. Islamic banks are gradually penetrating with loan at non interest rate making it easy to control your life while other banks that working under orbit of central Bank of Nigeria CBN cannot offer customers loan without imposing stringent heavy interest to encourage non Muslim to seek loan from Islamic banks as the best option. The merging of Islamic studies and Christian Region knowledge as one subject was another means to force pupil from Christian family to recite Quran in schools and failure to comply is bound to receive serious punishment. Today Christian Association of Nigeria CAN is lamenting on Buhari's perfection of Islamization agenda; this latest lament from CAN could be seen as "tales by the moon light". Their laissez-faire attitude at early state has backfired on them; shouting helplessly is just the Genesis. Crook that crooks might belong to household but its voice belongs to neighborhood. When Nnamdi Kanu, the leader of Indigenous people of Biafra was lamenting, none of them supported him but rather conspired against him to detain him illegally. Has their stand yielded any positive result if not romancing Nigerian government than speaking up at the appropriate time? Buhari's led government is using his Janjawed foot solders; Fulani Herdsmen to invade territories to force grazing in another person’s lands, the same way Kwara State (Yoruba Land) was conquered and now answerable to Emir from Sokoto instead of Oba. Raising of Islamic flag in Nigeria seat of power Aso Rock with different inscriptions to that of Boko Haram was a sign of fulfillment of long awaited Islamic agenda by Buhari. 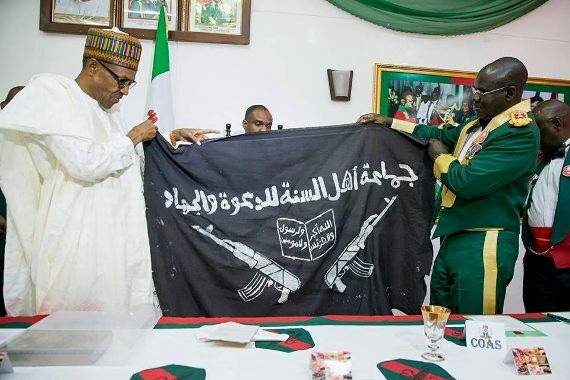 Nigerian military with their inherent unprofessional outing claimed to have sack Boko Haram from their enclave - Sambisa Forest but came back with Buhari’s Islamic flag in the guised of chasing terrorist group Boko Haram. It was a kindergarten exaggeration because Nigeria is Boko Haram vice versa, none cannot do without each other. Sultan of sokoto ordering the arrest of Johnson Suleiman according to World Global Watch News was the tip of iceberg that Nigeria is an Islamic caliphate; Christians must not fold their hands watching Islam overrun them unless their only interests are tithes and offerings. BIAFRA: IS THIS THE END OF BIAFRA RESTORATION PROJECT; TO QUIT OR TO CARRY ON? DID JUBRIL UNDERGO PLASTIC SURGERY TO BECOME BUHARI OR WHAT? Copyright © 2017-2018. The Biafra Post All Rights Reserved.